These days, any search for bighorn sheep in southwestern Colorado is an exercise in desperation. Bighorn hunters and advocates must train their eyes on game trails and alpine valleys and knolls, looking for a patch of gray-brown hide, for ewes grazing, for rams on cliff faces. They listen for rocks tumbling through canyons, or the baseball-bat crack of two rams butting heads. Fewer than 500 bighorns roam the 760 square miles of this rugged section of the Rocky Mountains. Still, desperation be damned, a group of citizen volunteers ventured out this August in search of them. They were led by one of Backcountry Hunters & Anglers’ unpaid leaders: The Colorado southwest regional director, Dan Parkinson, an earnest outdoorsman, who, from a certain angle, looks strikingly like actor Tommy Lee Jones. At 4:30 that morning, they began hiking in the predawn quiet, settling into a high-alpine valley, where tree cover was still sparse from a 2002 wildfire. 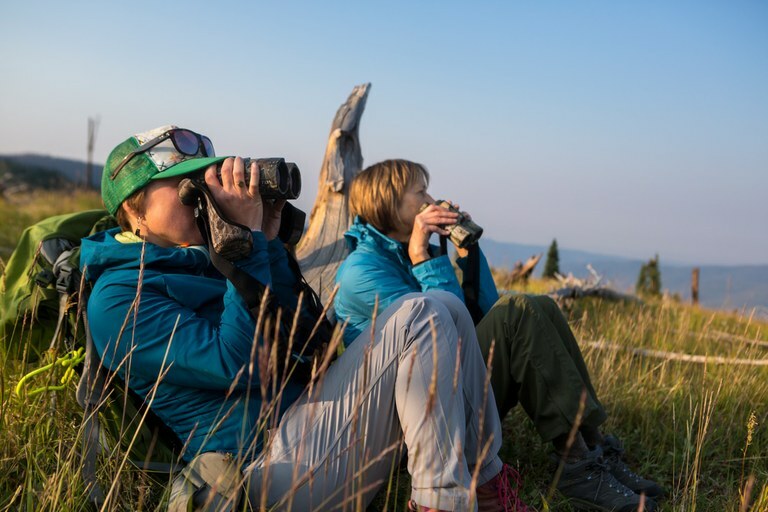 They set up their spotting scopes and binoculars on the crest of a hill overlooking the Weminuche Wilderness, where the Vallecito Creek herd has been known to roam. “Look for white butts,” a local guide advised them. “Like a pair of long johns on a clothing line.” As the morning wore on, one volunteer, Laurie Parkinson, pulled her watering eyes from her binoculars. “I can’t do this anymore,” she said wearily. But after a few minutes, hope got the better of her, and she was back to glassing. By the end of the day, she’d seen nothing. No one had. Volunteers Kara Armano and Laurie Parkinson peer into the morning light illuminating the east face of Endlich Mesa in search of bighorns. Parkinson had brought the volunteers into the mountains to help fill in some gaps in the data regarding how bighorns move across the landscape, an urgent need right now, as the U.S. Forest Service and state agencies consider the future of livestock grazing in the Weminuche Wilderness. The decision looms amid criticism of Colorado’s wildlife managers, who, some say, have lost their ability to actually protect wildlife. In general, they blame shifting priorities and politics in a downsized state agency. But more particularly, where bighorns are concerned, they blame the domestic sheep industry. 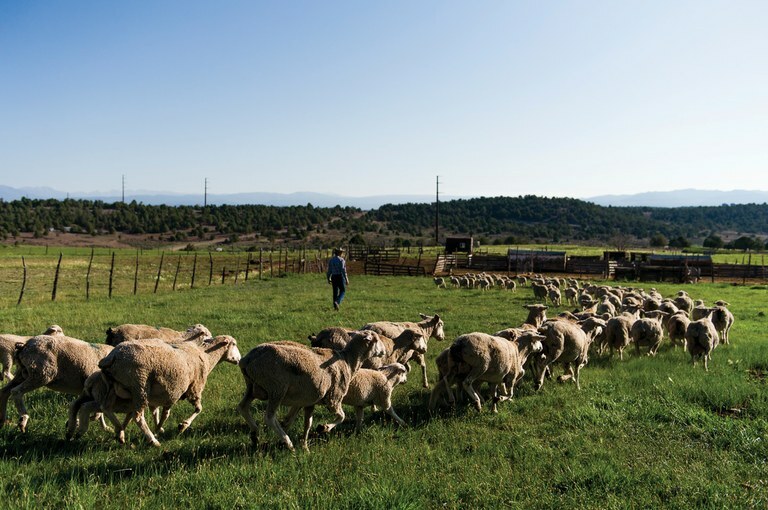 In fact, just four miles west of the volunteers lay the summer pastures of the greatest threat to the Weminuche bighorns: the sheep herd of a rancher named J. Paul Brown. If God made the high country for the sheep, then he also made their wild cousins’ worst enemy: Mycoplasma ovipneumoniae. Called M. ovi for short, the bacteria passes from domestic carriers to wild sheep, often leading to pneumonia and death. M. ovi was first detected in a flock of domestic sheep in Australia in 1974. In 1985, two bighorns at a Canadian zoo developed the disease after they came into contact with domestic sheep. A year later, the Canadian Journal of Veterinary Research provided the first evidence that domestic sheep and goats pass the bacteria to bighorns. People have been arguing about it ever since. In the American West, the disease has obliterated historic bighorn populations, especially in the Rocky Mountains. In Idaho’s Hells Canyon, for example, 10,000 bighorn once roamed the region around today’s Payette National Forest. By the 1940s, however, disease and habitat loss from domestic grazing had nearly wiped out the population. 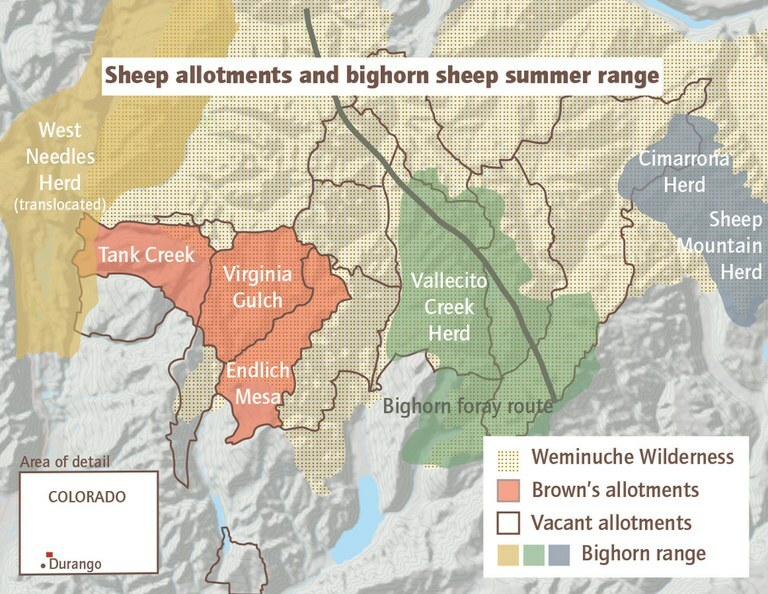 Similarly, in the Weminuche, researchers suspect that the Vallecito Creek herd has declined due to its exposure to nearby grazing domestic sheep. Wildlife managers typically separate domestic sheep and bighorn populations: Salt licks encourage bighorns to stay in safe areas, while herding dogs and gunshots scare them away from high-risk contact. In Colorado, a new strategy of allowing herders to kill bighorns that come in contact with their sheep is also being considered. The Weminuche bighorns comprise three herds, considered particularly special because they contain mostly native, non-transplanted animals and still have robust DNA that can be mixed with that of other struggling herds to strengthen their populations. Because of this, they’ve been given “tier 1” status by the Colorado Parks and Wildlife agency. The Vallecito Creek, Sheep Mountain and Cimarrona Peak herds are among the last native herds in the state. On the morning I went out with Dan Parkinson, we were in search of the Vallecito Creek herd, which has only an estimated 70 animals left and is the most vulnerable to a total die-off if its members contract M. ovi. Already, the herd is showing signs of possible exposure. The population has stagnated, and studies are currently underway to evaluate whether it has begun to decline. The survival rate of Vallecito lambs is low, and new additions to the herd often die — both indications of the disease. And because Vallecito rams are likely to migrate to other herds to breed with ewes, if the disease hits here, it will likely spread to the other two herds. All it would take to prevent this is the prudent separation of the bighorns from the domestics. But that has proven surprisingly hard to achieve. To understand why, you have to understand Colorado’s agricultural politics. J. Paul Brown stands for a portrait with his wife, Debbie Brown, outside their home in Ignacio, Colorado. 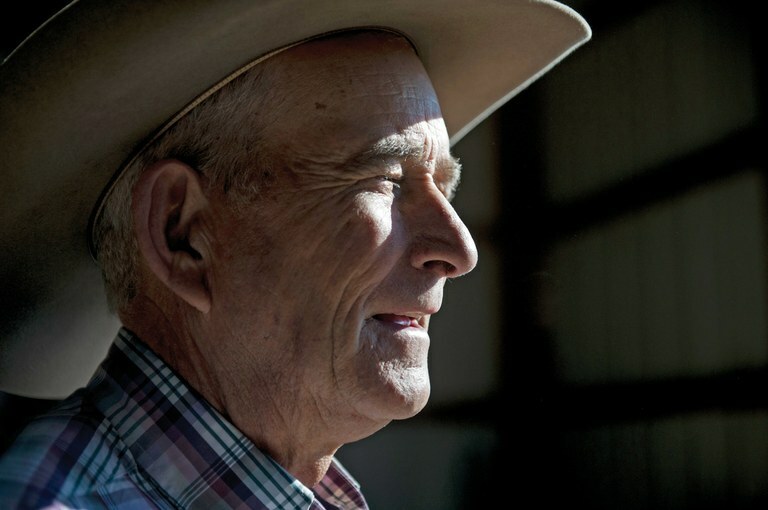 Paul Brown has been sheep ranching in southwestern Colorado for more than four decades. 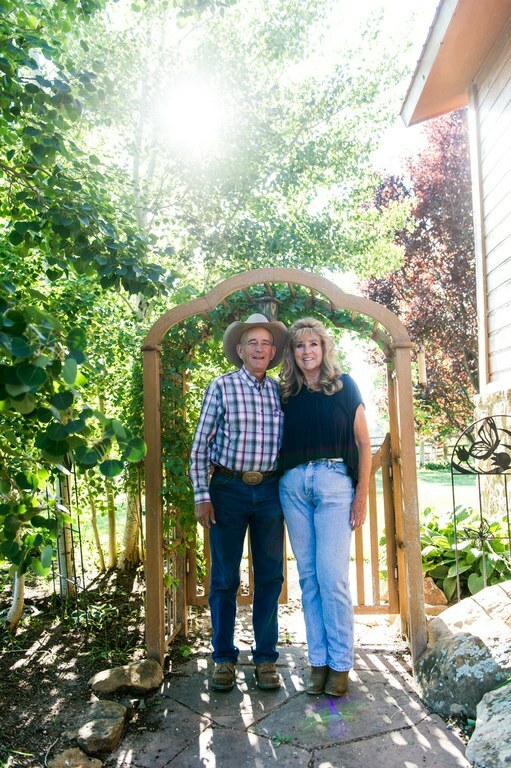 He and his wife, Debbie, built their ranch by transforming lands from “nothing but sagebrush and piñon-juniper” into productive land for their lamb and cattle operation. They started with little more than a “beat-up old red pickup truck” and a mobile home, in 1980. A few years later, they moved to their current property, grain silos dotting the horizon of a flat, shrubby expanse that had no running water or electricity. The Browns created an idyllic life, the family bonding over the breakfast table and in sheep camps high in the Weminuche alpine — J. Paul, Debbie and their four sons. As Brown built up his ranch, he also built his political career, serving as a commissioner for La Plata County and as president of the local school board. In 2010, he was elected to the state House, part of the Tea Party wave. During his tenure, Brown, a Republican, proved himself one of the most conservative members of Colorado’s Legislature. In 2011, he was dubbed “the bear guy,” for sponsoring a bill to overturn a 1992 restriction on bear hunting. (The measure ultimately failed.) In 2012, Brown was defeated by a moderate Democrat, Mike McLachlan, who became something of a political nemesis of his amid the purpling politics of the state. In 2014, Brown took back the seat from McLachlan, with the help of record-shattering donations from outside groups, including more than $50,000 from the agricultural sector. But in 2016, he lost to Barbara Hall McLachlan (Mike McLachlan’s wife) and, earlier this year, announced that he wouldn’t run again. To bighorn advocates, industry arguments sound a lot like those made by the tobacco industry — or climate change deniers. There’s already an abundance of scientific consensus, they say, and the risk of exposure is not worth it. In a 2014 study from Washington State University, for example, two experiments sought to better understand M. ovi transmission. Six wild ewes, captured in Oregon, were housed in two pens. 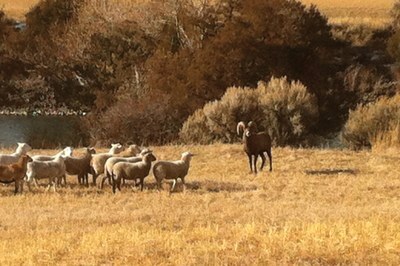 The bighorns in the second pen were exposed to one domestic sheep with M. ovi. All of the bighorns in the exposed pen contracted M. ovi, and all of them fell ill with a condition similar to pneumonia. And ultimately, all of them died. “The most striking finding of the experiments reported here was the high transmissibility of (M. ovi) and the consistent pneumonia that followed infection of bighorn sheep,” the study concluded. 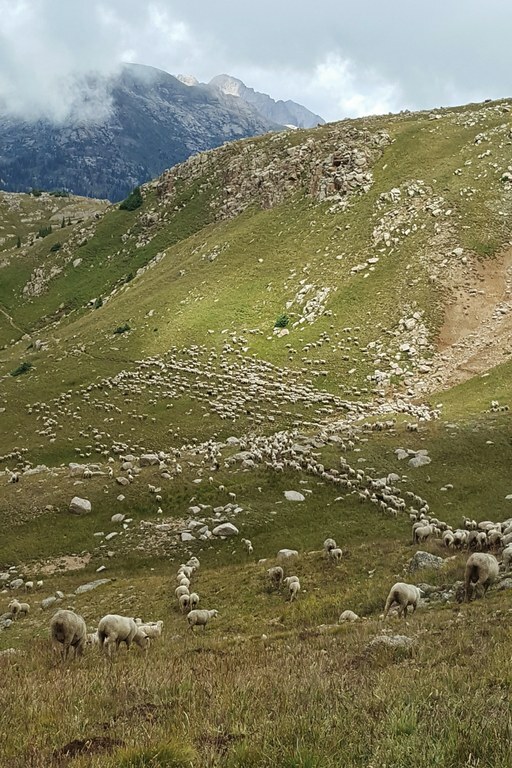 The Western Association of Fish and Wildlife Agencies, a consortium comprising 23 wildlife agencies from the West, currently recommends that wild sheep and domestic sheep be separated to minimize the probability of disease transmission. The Forest Service and the Bureau of Land Management’s own “risk contact model” recommends keeping wild and domestic sheep apart by 15 miles. But it’s not an exact science: Bighorn rams on foray have been documented traveling much farther than 20 miles. A bighorn ram amid a domestic sheep herd along the Yellowstone River in 2013. Wildlife biologist Kevin Hurley of the Wild Sheep Foundation was driving between Cody, Wyoming, and Gardiner, Montana, when he saw the ram jump the fence into the sheep pasture. He stopped and yelled and threw rocks to chase it away. In other words, research tells us that domestic sheep infect wild sheep, and the best way to keep sheep apart is to separate them. And yet in the Weminuche, the Forest Service, echoing the recommendations of Colorado Parks and Wildlife, has kept three high-risk allotments — those leased to J. Paul Brown — open to grazing, with less than a five-mile buffer between their easternmost boundaries and the known boundary of the native bighorn range. This is justified, they say, because the boundaries are split by Vallecito Creek, a natural buffer. The question is: Why is it still happening? Colorado’s current administration includes Agricultural Commissioner Don Brown (no relation to J. Paul), a third-generation dairy and corn farmer from Yuma, Colorado, and former president of the Future Farmers of America, a youth group with ties to the National Cattlemen’s Beef Association. The director of Colorado Parks and Wildlife is Bob Broscheid, the former director of the Arizona Natural Resources Review Council, which was created to tie natural resource management to the state’s economic development. One morning in January, both men addressed a gathering of the agency’s wildlife commission — in a way that demonstrates the agency’s current direction. Inside the Hunter Education Building in downtown Denver, over a breakfast buffet brimming with sausage, eggs and orange juice, Don Brown first addressed the room. In part, that’s because agriculture holds a certain amount of nostalgic political power in Colorado. The state’s leaders have a long history of propping up its agricultural sector, a nearly $8 billion industry that receives more than $165 million in state and federal subsidies each year. Yet even with the support it receives, the industry is struggling to reach its historic numbers. According to the latest census of agriculture, conducted by the USDA, Colorado’s sheep and goat farming industry was among the most lucrative in the country, surpassed only by Texas and California. But in Colorado and across the rest of the country, the sheep industry has been in a steady decline since its peak in 1942, when there were more than 56 million sheep in production. In the mid-1990s, sheep inventory dipped below 10 million nationwide, for the first time. The number of sheep-ranching operations has fallen from more than 110,000 in 1987 to fewer than 60,000 today. J. Paul Brown on his ranch in Ignacio, Colorado. Even as its slice of the economic pie gets smaller, the wool industry continues to wield surprising political power. In 2016, for example, wool industry lobbyists succeeded in including positive language in the Omnibus Appropriations Bill around maintaining a rancher’s “right” to graze sheep on public lands. When Sen. Lisa Murkowski, R-Alaska, submitted the final text of the bill on behalf of the Committee on Appropriations, it included verbatim text from a September 2016 letter from the American Sheep Industry Association. The text requires land agencies to go through the USDA’s Agricultural Research Service to verify claims of high-risk contact areas and to make vacant grazing allotments available to ranchers whose land becomes unusable because of bighorn conflicts. In this year’s Appropriations Act, the directive was carried over with no change. Additionally, a similar amendment included in the farm bill would ensure that ranchers with grazing permits are able to continue grazing despite natural disasters or conflicts with wildlife. The rider recently passed the House but, as of this writing, was stalled in the Senate. This all adds up to a small — and shrinking — industry using its influence to steer long-term grazing legislation in its favor. In Colorado, the industry wields its influence through Colorado Parks and Wildlife. On a bright spring afternoon in May, I met Dan Parkinson at a riverside restaurant at Durango’s DoubleTree hotel. There, he spread a massive map of the Weminuche Wilderness across two round tables, giving the parlor the feel of a war room. Across the map streaked a thin blue line of masking tape, which traced the path of a 3-year-old ram, likely on a foray in search of a mate. The line showed a 22-mile northwestern jaunt into the heart of the wilderness, through dense forest and past alpine lakes, and eventually crossing Vallecito Creek, just north of the boundary of one of Brown’s allotments. 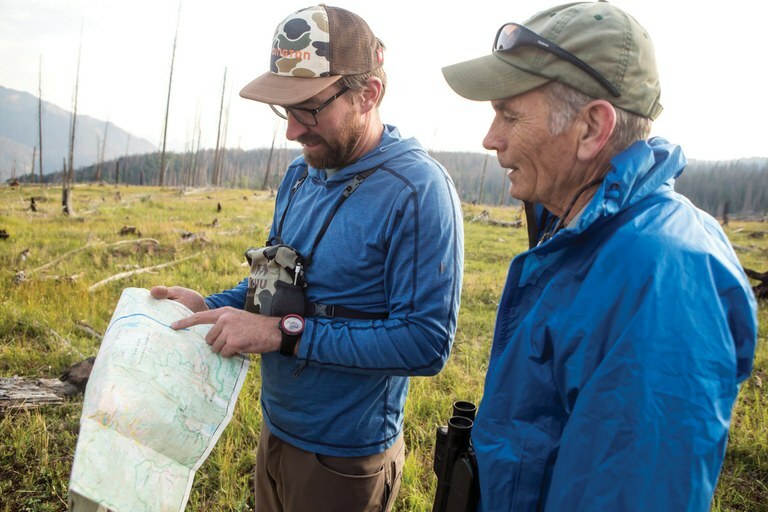 While searching for bighorn sheep on Endlich Mesa in the Weminuche Wilderness, Backcountry Hunters & Anglers volunteers Dave Croll and Dan Parkinson consult a map showing the route of a bighorn sheep that wandered through domestic sheep grazing allotments. When a bighorn is exposed to M. ovi, it can spell the end, either from illness or at the hands of humans. In the summer of 2016, for example, a flurry of encounters led to the killing of numerous bighorn sheep in the San Juan Mountains. In the first incident, a 2-year-old bighorn ram wandered into a domestic sheep pen on private property in Colorado’s San Juan Mountains, a few miles northwest of Durango and 18 miles from the Weminuche. A Colorado Parks and Wildlife spokesman dismissed the incident as an anomaly. But later that summer, a second encounter occurred between bighorns and domestic sheep that belonged to the same rancher — Ernie Etchart, who is also the president of the Colorado Wool Growers Association. After a third incident, Colorado wildlife officers shot and killed a total of six bighorns — an increase from past years’ reports. If the Weminuche bighorns succumb to M. ovi, or are killed for bumping into domestic sheep on public lands, critics argue it will be due to state wildlife managers’ inability to do their job. They point to the 2011 merger of the state’s Division of Wildlife with its Department of State Parks — one of the first acts of the incoming governor, John Hickenlooper, D. The measure was meant to save the state $4 million. It abolished 48 permanent positions between the two divisions, and created Colorado Parks and Wildlife, which kept the former era’s bighorn ram as its patch insignia. The new agency established a broad mandate with, according to its literature, “a more comprehensive outdoor recreation mission.” The result, according to multiple interviews with former and current officials, has been a shift in priorities that leaves wildlife preservation at the bottom rung. Indeed, agriculture and other business interests have direct influence on the agency, which is governed by the Colorado Parks and Wildlife Commission. Currently, there are more representatives on the commission with ties to agriculture, recreation and tourism than to conservation. Not a single wildlife biologist sits on it. It is likewise clear that the wool industry holds sway over the agency. In 2014, Parks and Wildlife signed a memorandum of understanding with the Colorado Wool Growers Association. In it, the agency agreed “that closure of active domestic sheep allotments on public lands will not be recommended based solely on the potential for interaction between domestic and bighorn sheep.” Such memoranda are not unusual, where agencies seek to coordinate with stakeholders to reach compromises on plans. But for the Weminuche bighorns, it has meant that grazing continues unhindered as the conflicting factions wait for the Forest Service to reach a final management decision for the wilderness. Though bighorn sheep advocates participated in early negotiations, in the end, they felt like their conditions for bighorns were disregarded. Instead, according to Meyers of the Rocky Mountain Bighorn Society, the agreement ties the hands of Parks and Wildlife, preventing it from advocating for the proactive closure of allotments to prevent disease outbreaks. “The notion that the wildlife agency cannot advocate for control or containment of the primary issue that’s affecting the wildlife population is very concerning,” he said. Outside influence in the agency has major implications, as the Forest Service creates its management plan. The Forest Service will follow closely the recommendations of a state agency like Parks and Wildlife, which has softened its language over the years where M. ovi is concerned. In 2014, an initial environmental assessment of sheep grazing in the Weminuche included strong language on the impacts of the disease and high likelihood of contact, saying that the “existing condition is undesirable due to potential for contact between domestic sheep and bighorn sheep, leading to the possibility of disease transmission between the two species.” Based on the best available science, the agency should “consider the possibility of moving domestic sheep bands from currently active allotments where the risk of contact with bighorn sheep is high,” the initial assessment said. In other words, as the Weminuche management plan nears its completion, the Forest Service is not only ignoring science, but it is following the recommendations of a Parks and Wildlife Commission that is stacked with industry representatives. The Forest Service has not announced a date for the final decision, but Parkinson and other bighorn advocates fear the outcome will not reflect the needs of wildlife. J. Paul Brown, who has been raising sheep in southwestern Colorado for four decades. Brown is the sole permitee in the entire Weminuche Wilderness. If the Forest Service’s final decision allows his allotments to stay in production, it will be a testament to the stubbornness not only of Brown, but of Colorado’s agricultural politics in general, where powerful individuals with backing from a well-organized industry can bend wildlife management to their will. The threat to bighorns is more than just M. ovi; it’s politics. The board that governs the state’s wildlife policies is appointed by the governor. And this year, two new candidates are locked in a race for leadership of the state. The Republican candidate, Walker Stapleton, is Colorado’s state treasurer. He won the state’s Republican primary in June, campaigning as “a proven conservative fighter.” His great-grandfather was once mayor of Denver (and a former leader of the Ku Klux Klan). If Stapleton wins, he would be Colorado’s second Republican governor in more than four decades. The Democratic candidate, Jared Polis, is a five-term Boulder congressman, campaigning as a Coloradan and entrepreneur “turning bold ideas into real results.” If elected, he would be the nation’s first openly gay governor. Polis’ primary victory is a testament to the leverage campaign financing holds over the state’s electoral process: He spent $11 million of his own fortune leading up to the primary. It is unclear whether the voters of Colorado know enough or care enough to vote for a governor who will reset the wildlife commission in a way that is more sympathetic to wildlife. Meanwhile, Dan Parkinson and J. Paul Brown continue their quiet feud in the mountains of southwestern Colorado — one man determined to save bighorns, the other equally determined to maintain his way of life. And so it was that one day earlier this summer, Parkinson was driving a road near his home in Bayfield, Colorado, when he noticed domestic sheep manure along the side of the road. J. Paul must be moving his herds, he thought. Parkinson followed the droppings until he reached Lemon Dam. Soon, he’d spotted a band of domestic sheep, followed by Brown and one of his herders. They were moving their sheep onto summer pastures, about 17 miles from the starting point of the path of the roaming ram he’d charted in blue tape. It would take just one encounter for these sheep to wipe out some of the last of Colorado’s state animal. Parkinson watched, powerless, as the sheep moved along the edge of Lemon Reservoir, then disappeared into the wilderness.